Good Earth Roasts grew up, got a job, and outgrew its love for sweet, traydor cocktails. Open daily from 9 a.m. to 1 a.m.
(SPOT.ph) "Most of my friends are from the area," shares second-generation restaurateur Jean Paul Cheung. "They're from Bel-Air, Urdaneta, Salcedo Village...I met them all at G.E.R." G.E.R. means Good Earth Roasts, which was a popular but now-defunct Rockwell watering hole where Jean (pronounced the French way) served rice bowls, chow mein, and pork asado buns with flowing ice-cold beer and jam jar cocktails. It was where young Gen X-ers would come for after-office drinks and where mama's boys hung out in their flipflops back when it was unacceptable to be seen in the racier areas of Poblacion. 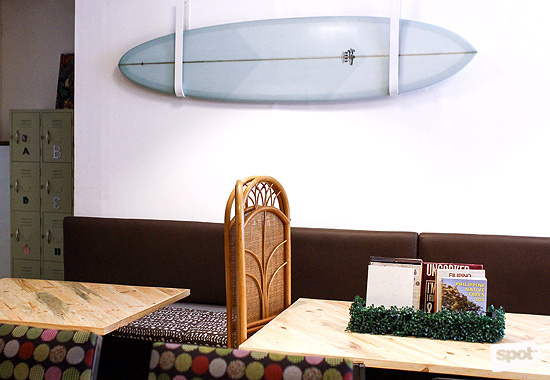 There's still a branch in Bonifacio Global City where old Rockwell regulars can trade stories. 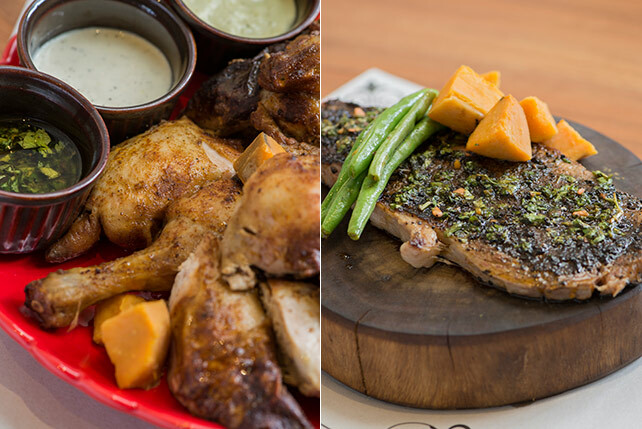 Jean and his wife, Patricia Locsin-Cheung, however, have also begun catering to the demands of today's diners. Enter Paseo 59C. It still has a homey vibe. 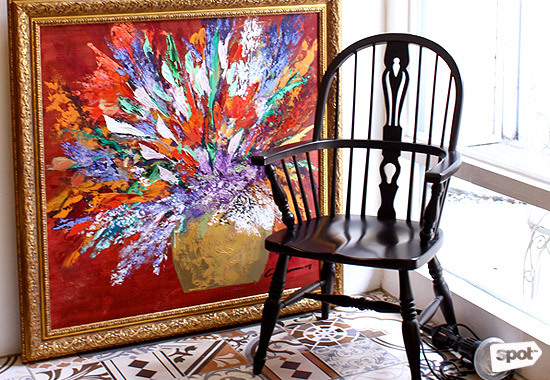 The location—an old Leviste home converted into commercial spaces—is cozy and inviting in its own right. 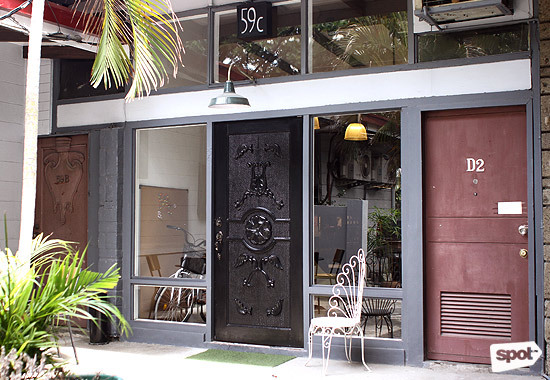 Paseo 59C is a "co-work" establishment and its casual but roomy setup is conducive to both serious work and creativity. Folding partitions subtly divide the main room, and electric sockets for chargers and laptops can be found everywhere. 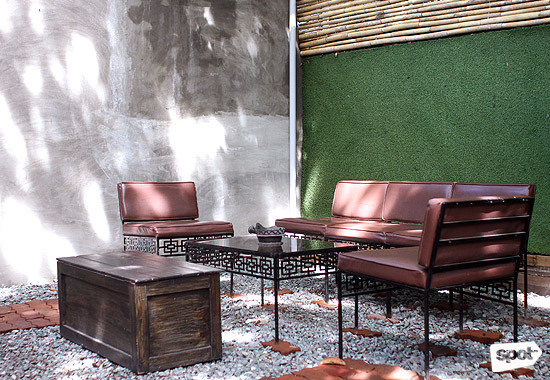 An al fresco area, which is impressively shielded from the dizzying buzz of Makati traffic, follows the same laidback, eclectic vibe. 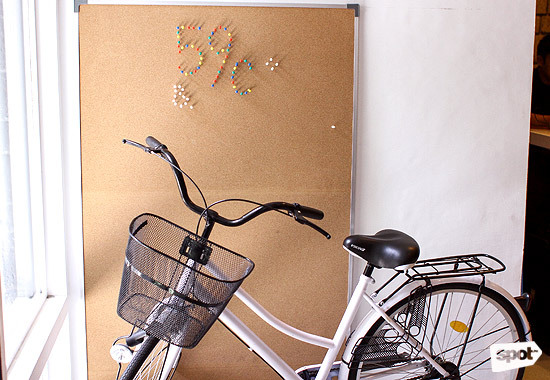 While work is encouraged, so is a fair amount of play. The bar is fully stocked and Jean understands the importance of a well-crafted cocktail to today's working stiffs. His Morenajito is mixed with Tanduay, his favorite rum—except that he uses the premium bottle that's aged 12 years. 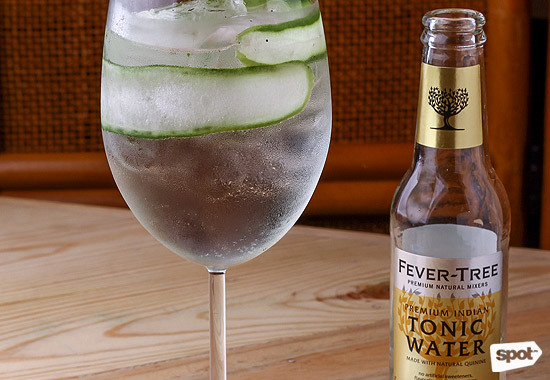 For gin and tonic fans, he offers a mean version with Hendricks and Fever-Tree tonic (P420). Simply garnished with a paper-thin cucumber slice and ground pepper, it's refreshing and well-balanced. This G&T is served in a balloon wine glass—just the way the Spaniards do it. The Cheungs—both skilled in the kitchen (Patricia was Margarita Fores' assistant for seven years)—decided they wanted to serve their idea of comfort food. 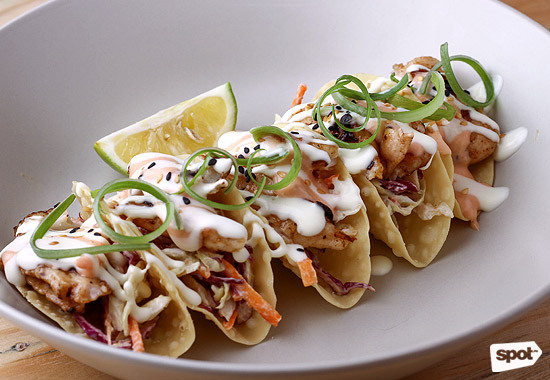 Asian, of course, takes precedence and the dishes are heavily inspired by G.E.R. 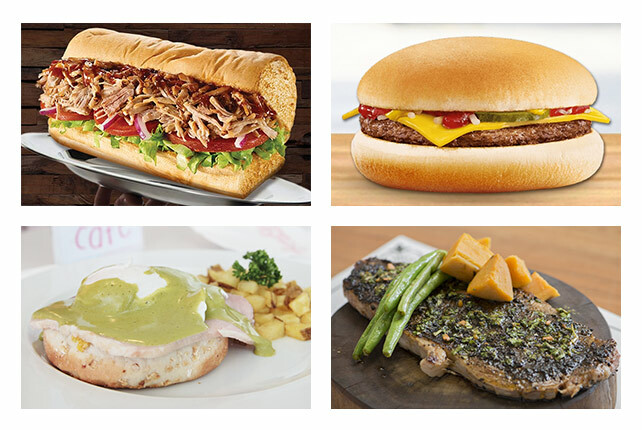 The menu is essentially food they love eating. Jean, for instance, can eat siomai every day. 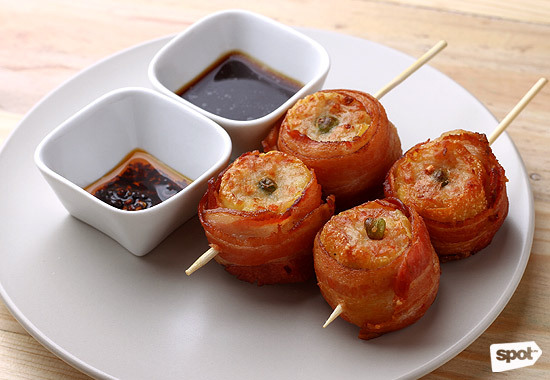 Their version (P170) is wrapped in bacon and deep-fried. The filling on their dim sum is hand-chopped, which Jean swears is the better way. Another crowd-pleasing steamed snack is their Fried Asado Floss Pao (P120). 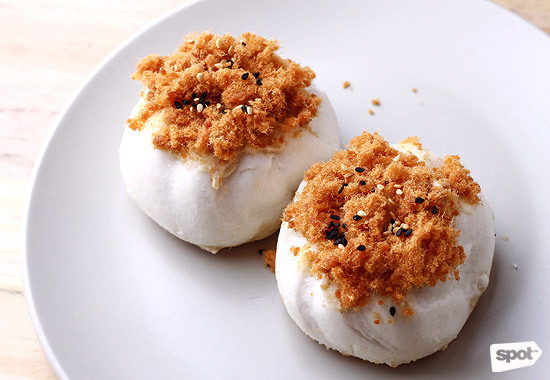 It's your typical asado siopao, but the bottom is fried until brown and crispy, while the top is adorned with salty pork floss. The flavors are spot on, but that clever revision proves how important texture plays in a dish. The Fishquitos (P260) is a spin on G.E.R. 's bestselling Duckquitos, changing the duck flakes to fish. 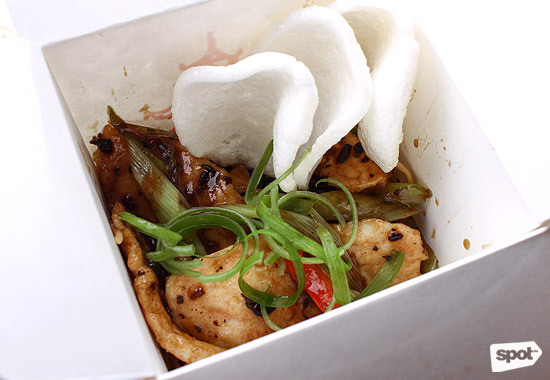 But if it's chicken, you're after, they have the General Tso's Chicken (P220). These crispy, battered cubes of chicken thigh coated in a sweet sauce are always a win. Paseo 59C doesn't drop the Asian theme even with their brunch, which is served all day, every day. 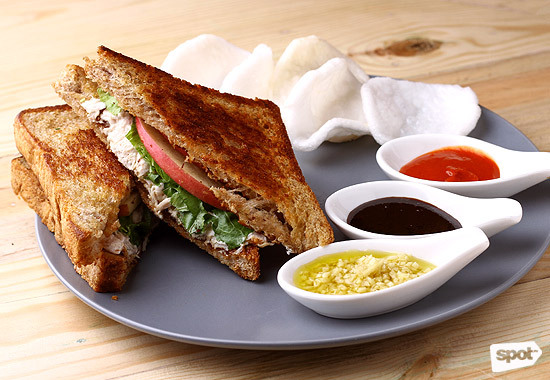 The Hainanese Chicken Sandwich (P260) is a welcome departure from the usual mayo-based sammies. 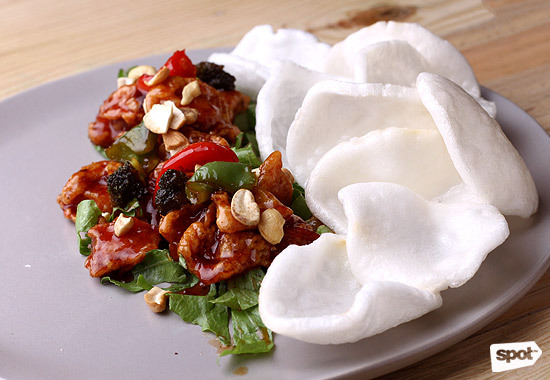 Served with the usual ginger and chili condiments, it's fun and flavor-packed. 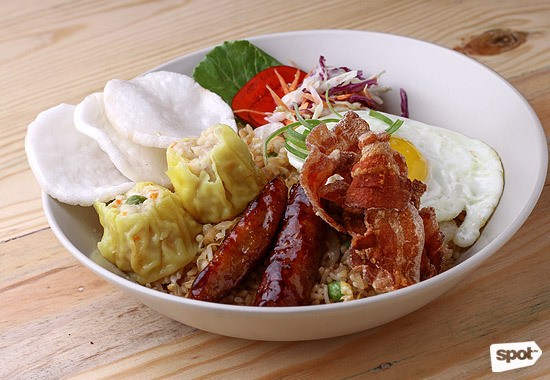 The Chow Mein (P260)—another one of Jean's favorites—curiously falls under the brunch category. Perhaps it's for someone waking up with the dull pain of a hangover? This Chinese classic comes as spicy, soy-laced noodles tossed with veggies, mushrooms, and chicken or fish. That's a cure-all combo. Hungry? 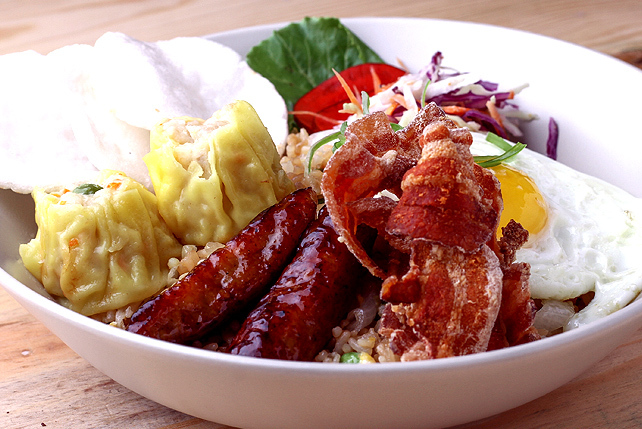 Their Brunchfast of Champions (P350), a sampler set of siomai, Chinese sausage, bacon, fried egg, sesame slaw, kropek all over fried rice, pulls all the right punches. Paseo 59C makes their own desserts, and Patricia is rightfully proud of their Calamansi Pianono (P200). 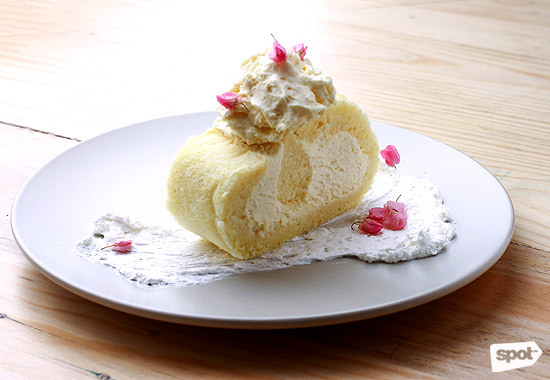 The pretty Ilongga grew up with the light chiffon cake roll, so she knows how to flavor it with the subtle fragrance of the local citrus. It's light and bright, a fitting end to a meal at 59C. Pair it with one of their third-wave coffee blends or a few shots of potent Slurp Salted Caramel Cold Brew (P150). Their coffee options are strikingly robust, a great way to sober up after a few cocktails. The couple is still tweaking the menu, reacting to customer feedback as they move along. "People are asking for more veggies and fish options, mostly our foreign guests," Jean confesses. The good thing is this perceptive couple is always willing to adapt.